In 2001, The Boston Globe’s Spotlight team is tasked with investigating claims of child molestation and cover-ups by the city’s archdiocese. 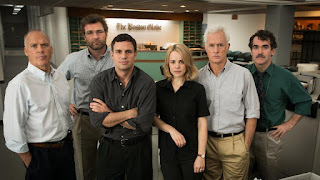 Spotlight could have been a very easy, very manipulative movie to make. There is an intrinsic heaviness within the film’s premise and any screenwriter could have exploited that aspect likely to much of the same critical and audience success it has seen since before its Best Picture Oscar win. On the same token it would have also been easy for a screenwriter with a chip on their shoulder about the Catholic Church to write an angry, searing indictment of organized religion and their nefarious institutions. Smartly (and thankfully), screenwriters Tom McCarthy and Josh Singer took the road less traveled and penned a dense and elegant story about the power of the written word. The film anchors itself squarely in the newsroom occupied by The Boston Globe journalists and every single event or reveal of information is seen purely from their perspective. This extremely zoomed in structure grounds the movie in a really nice way. We are on an equal playing field with every character since they are likely learning all of this information for the first time as well. I certainly remember when the first stories were published, but I was definitely underinformed on how the whole thing came about. The film isn’t particularly long or particularly slow, but the script is so excellent in that each line of dialog seems to carry a great amount of weight with it and combined with the already heavy subject matter led to an exhausting watch in the best possible way. The first scene between Liev Schriber’s Marty Baron and Michael Keaton’s Walter “Robby” Robinson is an absolutely gorgeous example of expositional dialog. Bolstering the script is a cavalcade of incredible performances. Each actor is on their A-game and while Mark Ruffalo is certainly a standout as Mike Rezendes, everyone has their moment to shine. This is some of the finest ensemble work brought to cinema in a long time and I am actually surprised the film received any acting nominations at the academy awards given that each actor is an equally important cog in this great information machine set-up by the screenwriters. If you were to remove one performance from the film it would likely nearly fall apart. Granted, that also serves as praise for the editing of the film which insures that there is no fat on the final product. All that to be said, Spotlight is in no way showy. It is conventionally scripted, acted, directed, and edited but the whole piece is in service to the larger themes at play. Yes, this is the story about the decades of abuse covered-up by the Catholic Church. But on a much grander level Spotlight is about integrity, accountability, collaboration, journalism, the digital age, and moral responsibility. Not to mention the underlying tension of how the devout Catholic town of Boston is going to react that one of its greatest institutions is being called into question. It’s a film that goes to prove that fundamentals are fundamentals for a reason. There’s a true artfulness in the simplicity of Spotlight’s storytelling and I would put a decent amount of money on the fact that not just anybody could direct this movie. There would be an overwhelming urge to frame someone near a picture of Christ or striking the crucifix pose to illustrate their persecution. But Spotlight chooses to just point the camera at high-caliber actors and let them tell you with their words and faces just what’s going on. Even the journalists interactions with the victims of priest abuse avoid being overly melodramatic and as such drive home the pain and confusion of their experiences. 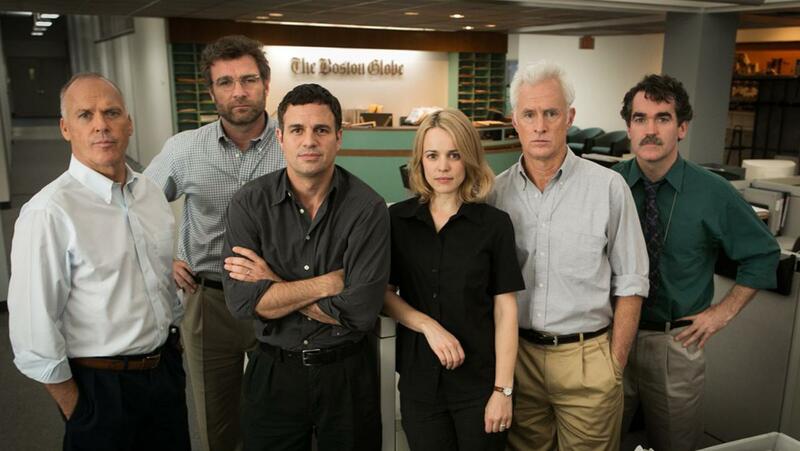 Spotlight is truly one of the great films about journalism. Not only will it be taught to film students alongside All The President's Men, it will also be shown to journalism students as an example of upstanding journalistic integrity and what it means to pick up a pen or keyboard to serve your community. All of it is wrapped in a neat little blanket of basic filmmaking techniques that let the story speak for itself and provides the viewer with enough information for break time wikipedia research for months. It never veers into emotional manipulation or melodrama while taking on the heaviest of subject matters. This is an incredible movie through and through and I am sad it took me this long to sit down and reckon with it.